The granny hair trend has been all the hype of late amongst the young adults, a colour usually dreaded by those who have naturally acquired them. If you have been wanting to try it, here are some important things you should know! Tried it? If you have, you’ll know how expensive it is to maintain this colour especially with dark Asian hair. But! We have just the solution! Gatsby Bleach & Colour in Aqua Silver is a great DIY dye that delivers as intended. Although it takes a lot more effort, and the colours may not turn out as evenly as it would in a salon, this method is a great way to refresh your hair without having to break open your piggy bank. It even comes infused with amino acid capsules for an all in one light bleach, dye and treatment! Though, we still highly recommend that you at least get the first colouration and multi-level bleaching done at a professional salon. After which you brave souls can follow this silver hair tutorial. IMPORTANT: Before you begin, remember to do a test patch as per instructed in the provided instructions. Also, DO NOT wash your hair right before dying as it might damage your hair. DIY Dye Set (Optional) – Recommended as they come with a dye comb and a cape to avoid mess. Wear an old t-shirt you don’t mind dirtying. Put on a protective cape if you have one. Split your hair into half by clipping up the upper half. Step 3: Prepare the mixtures. Your Gatsby hair dye pack comes with Agent 1 and Agent 2, plus a pair of gloves. Squeeze the contents of Agent 1 (squeeze tube) into Agent 2 (plastic bottle). Close the cap of Agent 2 and shake well vertically. Note: You can also add some conditioner into Agent 2 before adding Agent 1 for extra moisture just make sure the contents are thoroughly mixed before using. The more conditioner you put, the lighter the colour will come out (tried and tested by our Guru in the picture here :) ). Step 4: Begin the dying process on the first half of your hair. Just use your gloved hands to spread the hair dye as evenly as possible over your hair. Start closer to the roots but try to avoid the regrowth as the dye will turn black hair brown. If you have a dye comb, use it to comb through your hair for a more even distribution. Step 5: Let go of the clipped hair and repeat the dying process as quickly as possible. Step 6 (Optional): If you have time or want a brighter colour, cling wrap your hair. 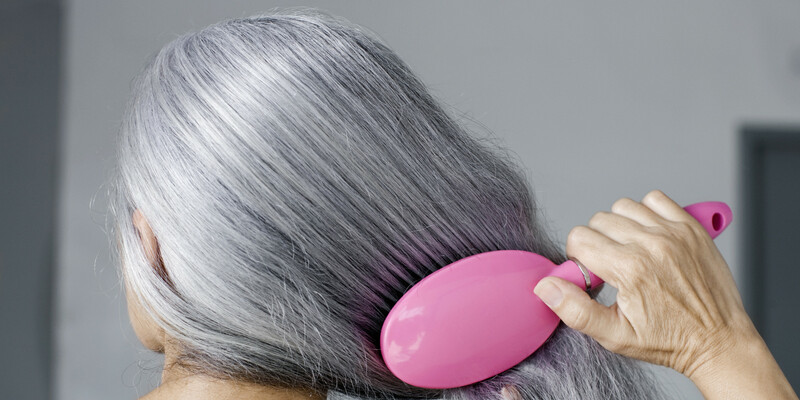 Do take note that if you leave it on for too long, your hair will turn a slight purple. This will of course wash out after a while and it will be a lovely shade of grey, allowing the colour to last longer. Step 7: Leave the colour on for 20 to 30 minutes or until the desired colour is achieved. You can test patch by gently rubbing bits of hair with wet fingers/cloth to see the current processing of the colour. Step 8 (Optional): Wash off and use a conditioner. A deep conditioning mask is also recommended at this point just for safety measures. Step 9: Wash, dry and you’re done! Note: The longer you leave it on and the purer the dye is (no conditioner), the darker the colour ends up. However, depending on your hair condition, it will lighten after each wash to a more silvery colour. The Gatsby Natural Bleach & Colour Series in Aqua Silver is available at all Guardian outlets and Guardian e-Store. Try the other colours as well! If you are one of the gutsy ones who tried this tutorial, let us know in the comments!